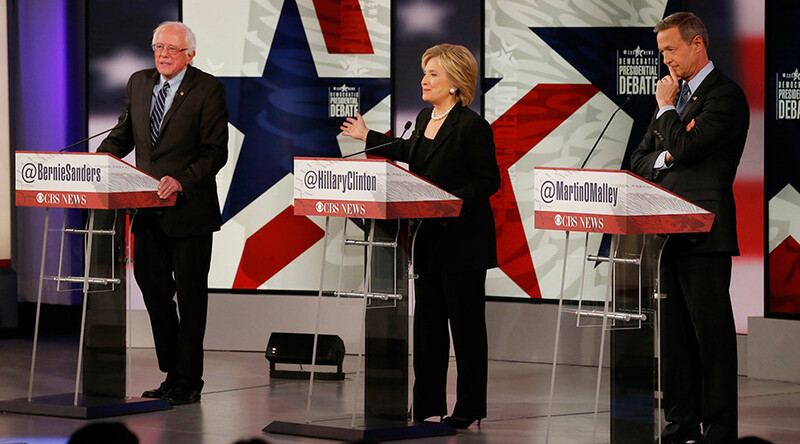 The trio of Democrat presidential nomination contenders met for the second debate in Des Moines, Iowa on Saturday. In the aftermath of the deadly attacks in Paris that claimed over 120 lives and injured over 300, the issue of the turmoil in the Middle East and the advancement of Islamic State (IS, formerly ISIS/ISIL) was the first topic up for debate. Vermont Sen. Bernie Sanders called the invasion of Iraq, “One of the worst foreign policy blunders in the modern history of the United States.” His criticism was targeted at the former Secretary of State Hillary Clinton, who voted for the Iraq War, when she was a New York senator. “I don’t think any sensible person would disagree that the invasion of Iraq led to the massive instability we’re seeing right now,” Sanders said. Clinton hit back by referring to the “historical context,” behind the decision to invade. “The United States has unfortunately been victimized by terrorism going back decades,” she said, recalling the attacks on US embassies in Kenya and Tanzania, as well as 9/11. “I think if we’re ever really going to tackle the problems posed by jihadi extreme terrorism, we need to understand it and realize that it has antecedents to what happened in Iraq,” she added. However, Clinton was forced to backtrack and with retrospect, would have reversed the decision she made over a decade ago. “I have said the invasion of Iraq was a mistake,” a phrase she would repeat on a number of occasions during the debates. Sandars and O’Malley went on to discuss the consequences of regime chance that Washington has enforced. “If you look at history… you will find that… these invasions, these toppling of governments, regime changes, have unintended consequences. I would say that on this issue I’m a little bit more conservative than the Secretary, and I am not a big fan of regime changes,” Sanders said. “It’s not just about getting rid of a single dictator,” said the former Maryland governor, O’Malley. “It is about understanding the secondary and third consequences that fall next,” he added, emphasizing the need for better intelligence and planning on the ground in the Middle East. When asked whether the US may declare war against IS, Clinton replied that there would be no need because an authorization for the use of military force (AUMF) was passed in 2001. "I would like to see it updated. I know the White House has actually been working with members of Congress -- maybe now we can get it moving again," she added. While the White House has been using AUMF for justifying its campaigns in the Middle East, the legality of these actions were questioned both by the US and by the international community.